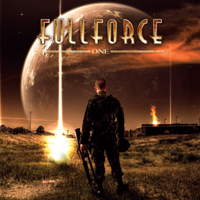 Swedish Fullforce consists of vocalist Mike Andersson (Cloudscape), Stefan Elmgren (ex-Hammerfall), C.J. Grimmark (ex Narnia) both guitar, Tommy Larsson (ex-Heed) on bass and finally Anders Johansson (Hammerfall, ex-Malmsteen) on drums. All musicians that have earned their stripes elsewhere and they know how to play their instrument. My expectations are rather high and most of the times I get a little disappointed then. That's the case here also. The songs are decent melodic (power) metal tracks and although there is not a real keyboard player in their midst, they certainly appear on the album. This is an album that has the stamp average on it all the way. Average songs, average singer, no surprises etc. I have a dozen of this kind of CD's in my pile. Not a bad album, but I have heard it all too many times before. Next time, try to be a bit more original and creative. A talented bunch of guys that have keep it too much on the safe side.